This section of the website contains materials and methods to help people learn how to do more good. You can read the FAQ, immediately below, or skip down to the Goodness Materials List. Why learn to do greater good? * Compassion and empathy for people who are suffering, and a desire to help them. * Wanting to feel better about the world, or their children’s future. * Religious or spiritual motivations. * To feel better about themselves. Doing good makes the world more beautiful. Accomplishing good gives you a sense that you have power and can make things happen. People appreciate and respect people who do good. * Wanting to give back; to help others because in the past they themselves were helped. How can people get the most out of these materials? 1) Find a “support buddy.” This is a person who each week asks you what you have learned and what good actions you are doing. They can check-in with you by phone or by email. But it should be weekly or regularly. It’s better if you support each other, but actually they don’t have to be actively interested in doing more good, just in supporting you. You can use a material we created called Buddy System Basics. 2) Create a journal or notebook in which you write down what you are learning, what your plans are to do good, and what happened. — Did it work out well or not; and what did you learn? After you read each material, use the 13 questions in the The Discussion and Action Group to help you ponder and apply what you read. 3) Actually set up a Discussion and Action Group with like-minded people. What should people read first? Whatever you want. Each material comes with a short description, so pick whatever makes sense to you. However, materials are grouped in three categories, from most to least important. So, we recommend that you start with the materials in the first section. Ideas for Those Wishing To Do Greater Good A list of ten themes or guidelines. Buddy System Basics This material contains steps and guidelines for setting up one-to-one support for any goals you have, especially learning how to do greater good. The Joy of Really Knowing That You Helped (Story) A story with commentary and questions. The ‘hero’ of the story tries to do good, but everything he does ultimately harms people. Supergoodness and the Surgeon’s Attitude Supergoodness is a new concept and standard for goodness. It changes the definition of what a good person is, and can inspire a higher quality and amount of goodness. Supercharity A simple idea that can lead to much less suffering and many fewer lives lost. Preferential Helping Most people believe that you should treat everyone equally. This thought-piece presents two reasons why this is not really the best policy. Natural Goodness and Greater Goodness An almost poetic series of statements about goodness. Helping Inventory (Your Portfolio of Love) (Assessment) This is a simple assessment. People sometimes have financial portfolios of their stocks and investments. You can create a “portfolio” or inventory of all the different ways you do good. Looking at how you currently invest your energy and resources can inspire you to improve or build on your portfolio of love and caring. Choices Regarding the Empowerment of Others (Assessment) Pondering these 18 different sets of choices can help you pick much more powerful ways to empower others and do good. Wise Giving of Time and Money This material includes the above two assessments, the piece on supercharity, and also several ideas to help you do the most good with your time and money, as well as tips for avoiding fraudulent charities. Root Your Change to Bear Fruit That Lasts An article about seven powerful and enduring sources of motivation. They sometimes fight against your best interests but most of them can be harnessed to help you deepen and extend your efforts to do good. Two Stories (Stories) A young girl outdoes two philosophers with her wisdom. A story about when to act. One Person’s Suffering (Story and Commentary) A horrific but true story, and a commentary that reflects on the various likely responses to the event. The Discussion and Action Group If you want to systematically think about and apply any of the ideas on this website, this article contains the steps to what is commonly called “experiential learning.” You can use these on your own, but they are better used with a group of people who have read or used the same material. Path Management (Method with Exercise) This material contains a framework for looking at life as either a series of “loves” (things that are life-enhancing) or a series of “sleeps”—things that are bad for you. The ideal is to walk a path from love to love, and avoid the sleeps that pull you off the path of fulfillment. Ethical Decision-Making This article covers seven different ways people make ethical decisions. CLEAR Actions Menu If you ask yourself the question “What would be the best, most loving use of my time right now?” you might have difficulty generating options. This long list of actions might give you more and better ideas for doing good. It’s divided into five sections, each symbolized by a letter in the word CLEAR. C stands for building capacity. L for Loving your life, or living your mission. E for empowering others. A for adding to the world’s stability and R for ripple-effect, or passing it on. Each of the five sections is further divided into short, ‘one-shot’ actions, longer projects, and finally building skills or relationships that require a larger commitment. 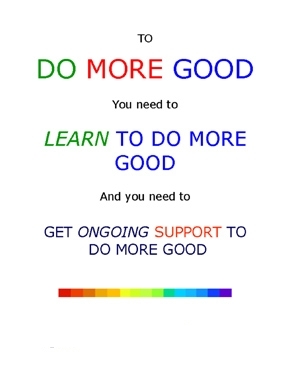 Learning the Art of Goodness Some personal reflections on learning how to do more good. The Cannon, The Confetti and the Light (Story and Commentary) A fiction story and commentary about how values affect the quality and quantity of the good we do. The Roots of Suffering Understanding the root causes of suffering might help people minimize human suffering. This article lists 25 different root causes. Then it groups most of them in one of four categories. Goodness as a Pure Art Form Some original thinking here. People currently think about goodness in one of three ways. They approach it religiously, philosophically or civically (as in what a person’s civic duties may be.) This article explains how goodness can also be approached exclusively or primarily as a pure art form. Just as the medium of music is sound, goodness has its own medium. The Good Woman Who Didn’t Go to Heaven (Story and Commentary) A short story and commentary that might jolt some people into a new attitude and definition of goodness and what it means to be a good person. It’s related to the supergoodness concept.